Camel herder in Rajasthan is submitted to ‘Explore Your State’ on National Geographic. Kristian Bertel has contributed to the National Geographic Your Shot community with an assignment called ‘Explore Your State’. Curated by Matt Adams, a senior producer at Nat Geo Your Shot invites us to share photos and stories featuring everyday moments. Show him the big and small moments that will make his heart sing, cry or laugh so hard he has to hold his sides. National Geographic wants to experience what life is like for each of us through our amazing imagery and stories that this time should show moments and photographs of everyday life. As Matt is saying it: ”- As photographers, we are explorers by nature. This assignment is about exploring your neck of the woods. Check out a map of your state. Is there anywhere in your state you’ve always wanted to go? Are there any places that jump out at you? Maybe a state or national park, or a city you want to explore with your camera? You can even stay local and explore your own neighborhood and show it to the world” he says. Horses, donkeys or mules would not be able to sustain journeys of many miles the way a camel can, owing to its ability to not need constant water. And, along with transport, camels also give milk and wool. The wool is used for rugs, blankets, and cots. After death, their skin can be used for leather, which is popular for local handicraft use. Camel bones are a more sustainable alternative to ivory, used for local artisanal work. This popularity once led to a boom in camel breeding, and India had the third largest camel population, with over a million camels. While urbanization and modernization have led to a fall in the demand for camels, the animal is still an enduring symbol for the people and this is why you will find it as a motif in almost all Rajasthani artisan work. Historically, it was the Raika caste who managed camel breeding for Maharajas. They were once the only camel herders and breeders in the world who also protected them from slaughter. The Raikas were also considered ‘camel doctors’, finely attuned to the various ailments of the animals. While they respected the great animal and only had contempt for the idea of selling camel meat, today it is sadly sold for slaughter. However, the Raika people still depend on the camel for a variety of needs. Camel milk is extensively used in the rural areas and small towns of Rajasthan. This effectively supplements the shortage of milk which common in many rural areas. 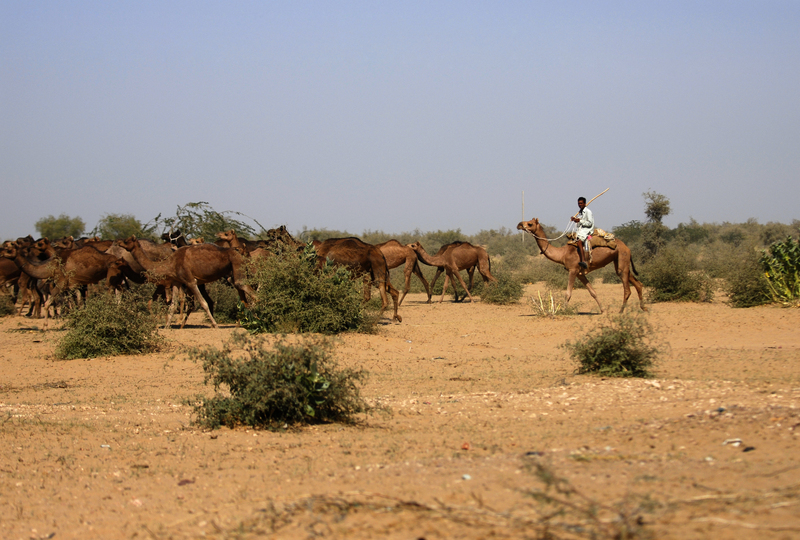 Thar Desert villagers use camels to lift water from deep wells. In some parts, camel dung is mixed with grain and used as fertilizer. Considering the region’s water scarcity, their minimal grazing and low water requirements makes them a better animal to keep than goats and buffaloes. Camels can move heavy goods like wood, fodder, gas cylinders, fabrics and bricks on two-wheeled carts, and these carts can generate enough daily revenue to support a family. A camel is an even-toed ungulate in the genus Camelus that bears distinctive fatty deposits known as humps on its back. ”- Camels have long been domesticated and, as livestock, they provide food such as milk and meat and textiles such as fiber and felt from hair. As working animals, camels which are uniquely suited to their desert habitats are a vital means of transport for passengers and cargo. There are three surviving species of camel”, the photographer Kristian Bertel says.